HARTFORD, Conn.--(BUSINESS WIRE)--Corbin Advisors, a research and advisory firm specializing in investor relations (IR), today released its quarterly Inside The Buy-side® Earnings Primer report, which captures trends in institutional investor sentiment. The survey was conducted March 13 to April 3, 2019 and is based on responses from 76 institutional investors and sell-side analysts globally, representing more than $768 billion in equity assets under management. Following the freefall in investor sentiment during 4Q18 earnings season, analysts and investors have landed on slightly firmer ground. Neutral to Bearish or Bearish sentiment, which climbed to 49% last quarter, dropped to 33% in 1Q19. Accompanying the improvement in sentiment was a slightly more optimistic perceived management tone, as 45% describe executives as Neutral to Bullish or Bullish, up from 37% last quarter. This reflects fewer concerns with market pressures that peaked last quarter. Rising interest rates, which were identified as a top concern in our last survey, are no longer a worry for nearly 80% of respondents, as 54% Do Not Believe the Fed will raise rates in 2019. As well, those expressing Continued or More Concern with a recession fell to 43% from 59% last quarter. “I am less concerned about a recession versus last quarter due to the resiliency of the U.S. economy and the nimbleness of U.S. corporations in their ability to innovate and capture market share outside of the U.S.,” noted Mark Mandziara, Senior Managing Director at BTC Capital Management. Still, growth is expected to slow, with 82% anticipating 2019 U.S. GDP at or below 2.5%, compared with 77% the previous quarter. Nearly 60% also report that 2019 outlooks were In Line with expectations, which were for more conservative guides relative to 2018. Concerns over tariffs, rising input costs, interest rates, a recession and the December stock swoon have receded and given way to a more stable investing environment. Investors generally report taking a wait-and-see approach and are looking at broad trends across industries to see how companies fare in a slowing growth environment. Reflecting the changing times, 70% of survey respondents note they are placing More Emphasis on balance sheet strength versus a year ago; ideal Net Debt-to-EBITDA targets for nearly all sectors (ex. REITs) is 2.0x, down from 2.5x in 2016. Among sectors, Technology and Industrials registered the most significant increases in bullish sentiment, while Building Products, Financials and Consumer Discretionary remain the most out-of-favor. REITs warded off bears for the second consecutive quarter, receiving the least negative sentiment in three years. Since 2006, Corbin Advisors has tracked investor sentiment on a quarterly basis. Access Inside The Buy-side® and other research on real-time investor sentiment, IR best practices and case studies at CorbinAdvisors.com. Corbin Advisors is a specialized investor relations (IR) advisory firm that partners with C-suite and IR executives to drive long-term shareholder value. We bring third-party objectivity as well as deep best practice knowledge and collaborate with our clients to execute sound, effective investor communication and engagement strategies. Our comprehensive services include perception studies, investor targeting and marketing, investor presentations, investor days, specialized research, and retainer and event-driven consulting. Inside The Buy-side®, our industry-leading research publication, is covered by news affiliates globally and regularly featured on CNBC. To learn more about us and our impact, visit CorbinAdvisors.com. 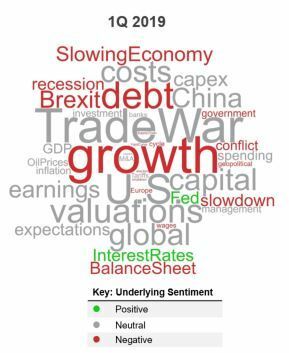 Corbin Advisors' research finds investor sentiment improves to a more neutral stance. Fears of an imminent recession recede.